Most people probably know that the Square Mile has its own police force, separate to the Metropolitan Police. Not so well known is that this constabulary can be considered as the reigning Olympic champions at Tug of War. The pulling policemen of the City won gold for Great Britain at the Antwerp 1920 Olympics. 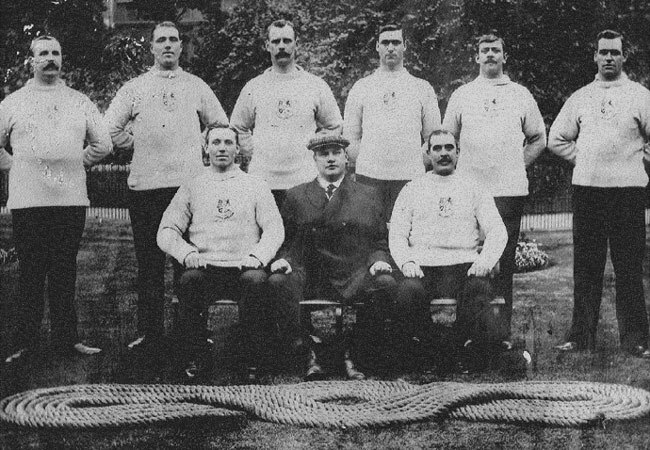 The crew also claimed gold at the London 1908 Games and provided some of the muscle power for the silver-winning team at Stockholm 1912. As the event has not been staged since the victorious 1920 effort, the City of London Police remain the champs (technically, it's Great Britain, but all competitors were drawn from the small police force). In case you're interested, our golden boys are George Canning, Frederick Humphreys, Frederick Holmes, Edwin Mills, John Sewell, John James Shepherd, Harry Stiff and Ernest Thorn. All have Wikipedia entries. Another curious fact: according to the City of London Police web site, the constabulary has fielded at least one competitor at every modern Olympic Games. Not a bad record for an entity that currently has just 1,200 representatives. The plucky constabulary was all set to stage a mock defence of its title at the Tower of London on 17 May, but the event has now been cancelled for reasons undisclosed.